Great suggestions, even if I was less than glowing about “Mend the Living”. I have a few lined up for this year (as always), stay tuned!! 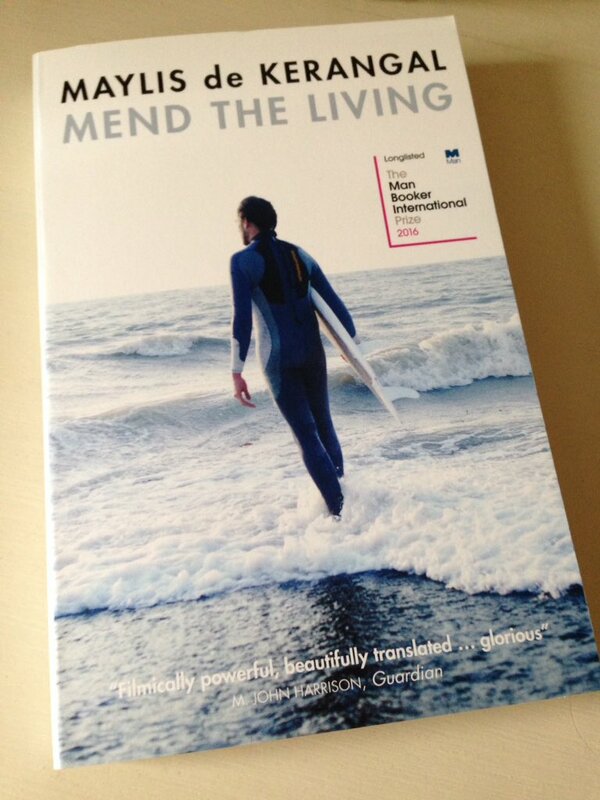 That’s interesting about Mend the Living – what didn’t you like about it? I haven’t been reading much contemporary fiction of late, but this one really stood out for me. I guess it was the combination of the clinical and the emotional issues that pulled me in. Plus the quality of writing, of course – always an important factor in these things. I don’t want to pepper your blog with negativity as I’m a lone voice on this one, but actually hated it. My review at my blog covers it. Fair enough – life would be very dull if we all liked the same things! I’ll take a look at your review. Great list Jacqui, there are so many great reads for #WITMonth. Thanks, Belinda. Are you thinking of joining in this year? I might do, I’m not sure. 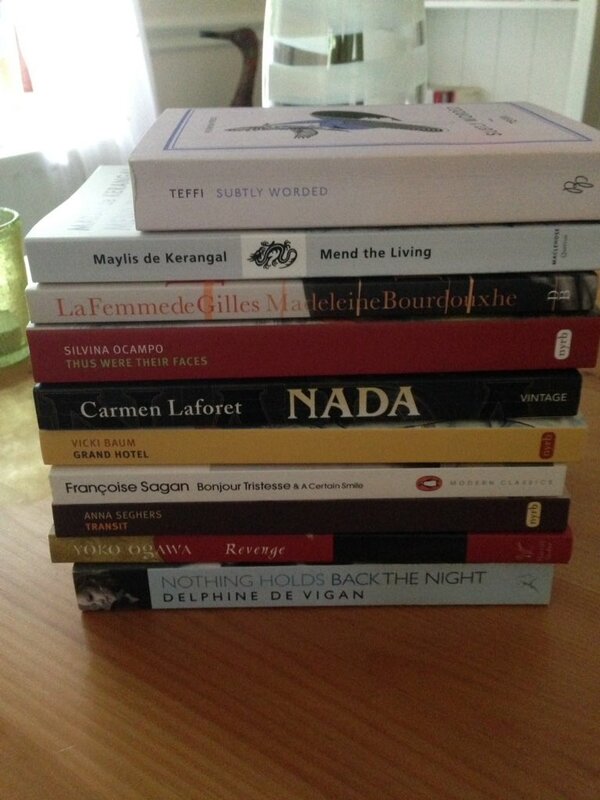 I have at least a couple of non-fiction books by women in translation I could bump up the pile. Oh I love this, thank you for doing this, it’s just what I needed, I loved Bonjour Tristesse and NADA and those interlinked stories of Revenge by Yoko Ogawa are a collection like no other. My favourite translation last year was the NYRB classic The Bridge of Beyond by Simone Schwarz Bart and this year I’m planning to read The Complete Claudine by Colette and Iza’s Ballad by Magda Szabo. I read so many off my shelf last year I need a top up! Oh, you’re very welcome, Claire. I remember your review of Nada – I’m pretty sure it was the one that persuaded me to read the book! Colette sounds like a great choice – she’s such a delight to read, especially in the summer. I hope you find a few other things to tempt you during the month – there are bound to be several recommendations flying around. Blimey, that’s a worry about the recommendations on the Waterstones’ website! I’m a bit shocked to hear that only one of their selection was written by a woman. I kind of expected the balance to be skewed towards male authors but not to that great an extent. Maybe they have a bit more scope in some of the bigger shops to put more of a mix of books on display? I’m pretty sure that women in translation are better represented there – the London Piccadilly branch has a couple of tables of translated fiction (maybe more if you include the displays devoted to small independent presses), including a fair spread of titles by women. Having enjoyed Mend the Living so much, I’ll be very interested to hear how you get on with Birth of a Bridge. I don’t think I’ve seen any reviews of it at all, other than a few soundbites from the blurb that accompanied her latest one. The Kawakami should be a great choice too – I very much enjoyed her other one, Strange Weather in Tokyo, when I read it a few years ago. German Intelligence in the 1960’s, that were levelled at her in 1989. As well as exploring these accusations the book mingles accounts of her intellectual life and some quite serious wining and dining she enjoyed in the US. A fascinating and disturbing book. Also another favourite translated from German, ‘Who is Martha,’ by Marjana Gaponenko. And from Hungarian of course there is the wonderful Magda Szabo. We have reviewed The Door and Iza’s Ballad. Yes, of course – it’s always good to hear of new recommendations. Christa Wolf has been on my radar for a few years (largely as a result of reviews by other bloggers), so I really ought to give her a try at some point. The one you’ve mentioned is completely new to me. It does indeed sound both fascinating and disturbing – I’ll look it up. Who is Martha? I have on my kindle, but it always gets forgotten about when it comes to selecting something new to read! Somehow the physical books on the shelves are so much more visible and accessible as they tend to catch my eye on a regular basis. Maybe I could read it for German Lit Month later in the year? Thank you for your suggestions, they are most welcome. Great suggestions – I still haven’t read Nada, so I should try to get hold of it somehow. Thanks. Nada’s terrific, and right up your street. There is a touch of the Gothic about the atmosphere Laforet creates in this book, especially towards the beginning. I think you would enjoy it a great deal. I thought La Femme de Gilles was quietly devastating, but – like you – I’d highly recommend it. Yes, the ending comes as quite a shock, doesn’t it? But then again, in hindsight, it all feels so painfully inevitable. A very accomplished little book. I have Mend the Living but not yet got around to reading it. From this years reading I can highly recommend The Vegetarian by Han Kang and Goodbye Tsugumi by Banana Yoshimoto. I am hoping to get some #WITmonth reading done, I have several contenders including some Vicki Baum novels. Trouble is in August I do All Virago all August with the LT virago group. What a lovely list of books. With War and Peace in Progress and books lined up for ll Virago All August I may not be able to find time for many Women in Translation this year, but I have ‘Grand Hotel’, ‘A Broken Mirror’ by Merce Rodoreda and a few other possibilities lined up. I’m not sure if you’ve read Rodoreda, but I can definitely recommend ‘In Diamond Square’, which was quietly reissued by Virago a few years ago. Thanks for this Jacqui – some very tempting suggestions! I’m off to search through the TBR for contenders…. Ooh, some great books here, many for re-read. I think you are right, the Sagan would be an excellent August peruse. Not quite so summery is Marlen Haushofer’s, The Wall. Austrian writer this Was Published in 1968 but republished due to a wonderful film made of it, Die Wand, In 2013. A Brilliant performance by Martine Gedeck,it uses the text of the book, which is an journal kept by The character/narrator. I Reviewed both. Its One of the few occasions For me Where Book And Film Enhance Each Other. I Read The book First and Approached The Film With Needless Trepidation. Apologies For The Rash Of Capitalising First Letters. i Have No Idea Why Periodically The tablet decides To Do This. It Becomes Tiring To Go Back And CHange Every Capital, once I notice what it’s doing. Then, just as mysteriously, as now, it stops! The Wall is a great suggestion, a book I’ve been aware of for a while but have yet to get around to acquiring. I didn’t realise that it had been made into a film, not too long ago either by the sound of things. I shall have to look it up. Thank you for that. Some great suggestions. I’ve read four of them – Subtly Worded, Nada and Revenge as well as Mend the Living – all well worth reading. There’s also a couple on your list that I rewoally need to get round to! I think you would enjoy Ocampo’s stories. They’re unusual and intriguing, a little like some of Roald Dahl’s Tales of the Unexpected. La Femme de Gilles is well worth reading too – it’s another book that might well appeal to you. I’ve already read three of them and have Nada on the shelf. From France, I’d recommend Fred Vargas and Virginie Despentes. Both excellent. I was going to say something similar – everyone seems to enjoy her. Is there one in particular you would recommend? Start with the first Adamsberg, I suppose, it’s a series. There are billets on my blog and reviews at Guy’s. It’s nice to see lists of bloggers’ favourite Women in Translation books. I’m not officially taking part in the event (summer blogging is really sporadic for me), but I have recently read two books translated from French to English: Boundary: “The Last Summer” by Andree Michaud and Pelagie: A Return to Acadie” by Antonine Maillet. Very different from each other, but both good reads!